The approach to safety management may vary among organizations but the objective is the same: reduced risk, improved safety. Building an accurate business case for SMS implementation is not an easy task. SMS builds on existing elements in the organization. 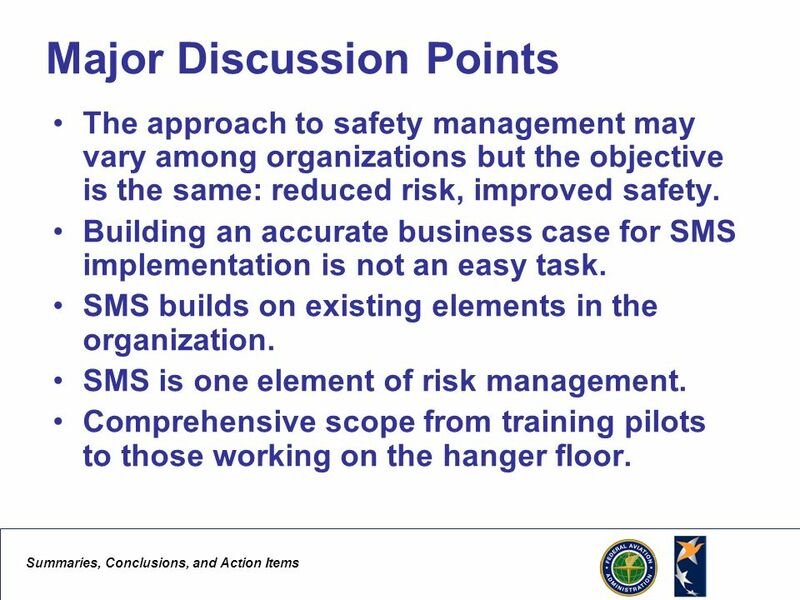 SMS is one element of risk management. Comprehensive scope from training pilots to those working on the hanger floor. The approach to safety management varies Bombardier: started SMS without preparing a formal business case in Benchmarked other companies. Reviewed TCCA requirements. Developed a framework and roadmap in Did a comprehensive gap analysis across all sites. Analyzed results. Adherence to company practices important to move forward. Identification and elimination of duplicate processes across the organization led to cost savings. Safety policy developed and issued. Now working on a compliance plan and implementation. Multiyear budget defined. Managing organizational change is biggest challenge. Implementing SMS is a learning process. Air France: SMS builds on existing elements in the organization. It does not start from scratch. Evaluated against ICAO documents. Already 95% compliant. Meet ISO 9000 standards. 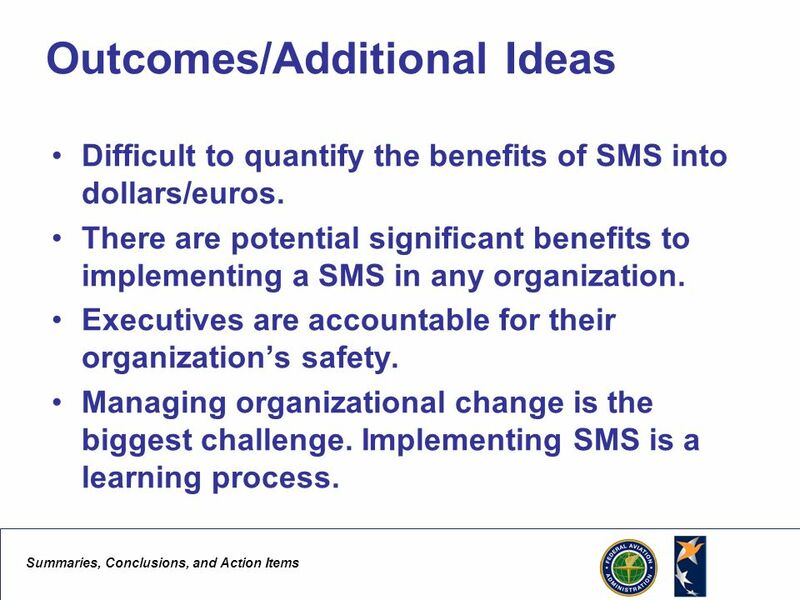 SMS is one element of risk management. Moving from reactive to proactive approach to safety. Beginning of the process. Working on case studies. On the way to SMS implementation. Did not develop a business case. SMS is one of many management areas, but needs tools. IBAC: International standards for business aircraft operations. Comprehensive from training to the hanger floor. Built around SMS. Developed by the industry for the industry. Performance based standard. Scaleable. Over 100 companies around the world. Audits required for certification. Revised annually. Tools developed to do risk analysis. 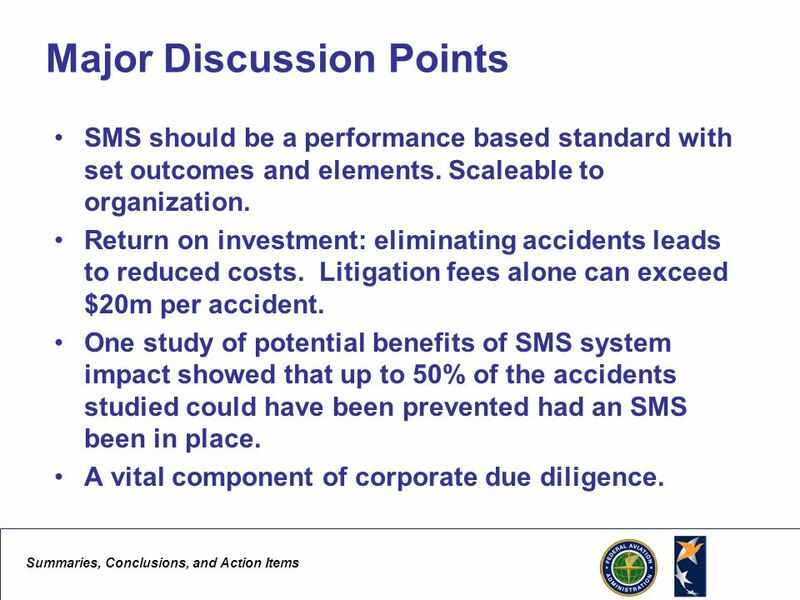 Study of benefits of SMS system….50% accidents could have been prevented. EASYJET: Minimizing loss through risk management. Can’t translate safety into money. Safety is everyone’s responsibility. SMS evolves from a compliance base. System evolves with experience. Moved from a reactive approach to a more proactive one. Study done and areas not being addressed identified. Safety approach was not a systems one. Insurers requested evidence of risk reduction. Self governance requires tools and standardization not just increasing safety employees. More data than ability to analyze. How to represent risk model to management. Costing various approaches along with impacts and defining costs of not taking action. Return on investment: Reduced accidents leads to reduced costs. Litigation alone can exceed 20m per accident. Insurance costs reduced. Reduced costs of duplication of efforts. Intangible benefits include improved employee attitudes because of organizational implementation. Leads to improved evaluation of safety issues which cross functional lines. Improved financing for new equipment. Improved confidence of employees and management in the safety system. A component of corporate due diligence. SMS should be a performance based standard with set outcomes and elements. Scaleable to organization. Return on investment: eliminating accidents leads to reduced costs. Litigation fees alone can exceed $20m per accident. One study of potential benefits of SMS system impact showed that up to 50% of the accidents studied could have been prevented had an SMS been in place. A vital component of corporate due diligence. Does one size fit all? Should there be a common standard? Outcomes, elements are the same, but how one meets the standard varies. It should be aligned with the business model not just compliance requirements. 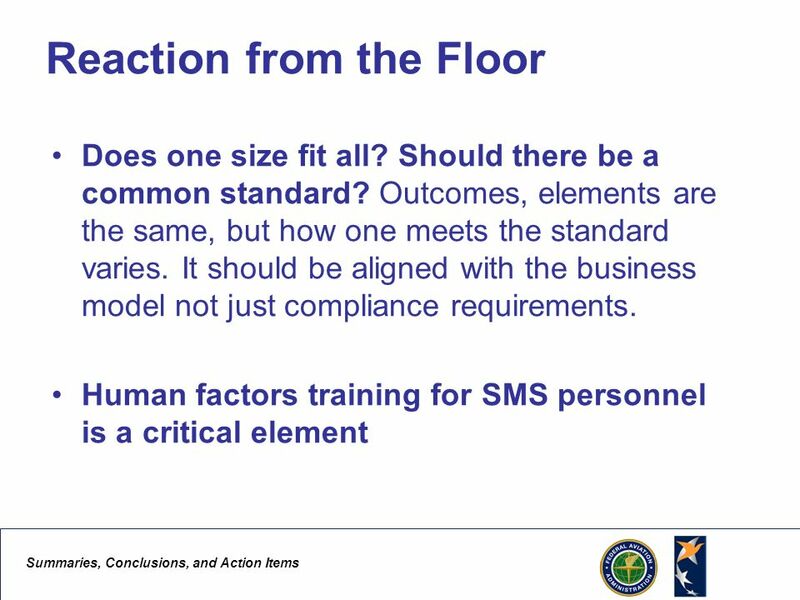 Human factors training for SMS personnel is a critical element Does one size fit all? Should there be a common standard? Outcomes, elements are the same, but how one meets the standard varies. It should be aligned with business model not just compliance. Linking safety risk to an optimized process. There is a cost to safety. Reduced accidents save money. What are you doing beyond risk assessment? 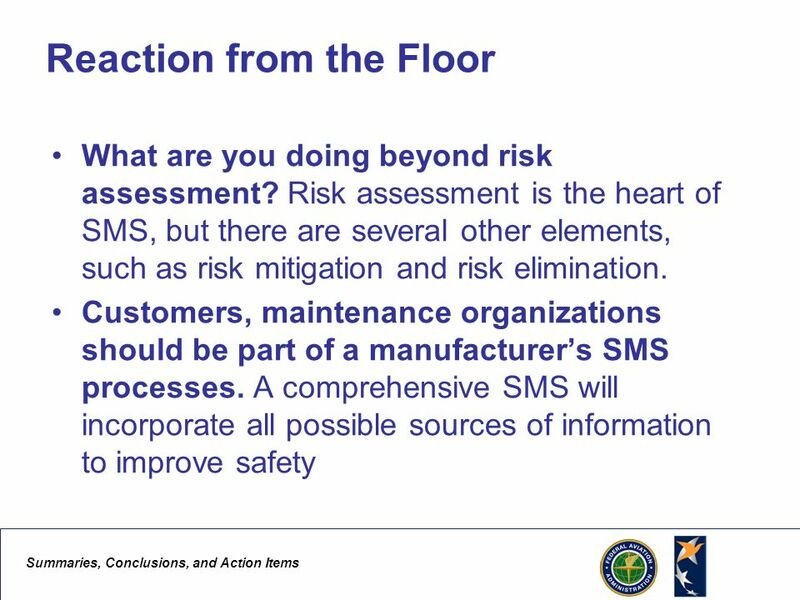 Risk assessment is the heart of SMS, but there are several other elements, such as risk mitigation and risk elimination. Human factors training for SMS personnel needed. ICAO requires SMS training for all personnel involved. Human factors issues in all processes. ISBAO requires HF training as part of the program. Customers, maintenance organizations should be part of a manufacturer’s SMS processes. A comprehensive SMS will incorporate all possible sources of information to improve safety. Each organizational element may have their own list of safety issues which may be different from the lists from other elements. What are key metrics that support cost benefit analysis? No specific business case metrics have been developed. Indicators not necessarily linked to costs or savings. Working to develop better metrics. Difficult to quantify the benefits of SMS into dollars/euros. There are potential significant benefits to implementing a SMS in any organization. Executives are accountable for their organization’s safety. Managing organizational change is the biggest challenge. Implementing SMS is a learning process. Should develop and implement one standardized master SMS approach that is accepted by all authorities. Difficult to quantify the benefits of SMS into dollars/euros. There are potential significant benefits to implementing a SMS. Executives are accountable for their organization’s safety. 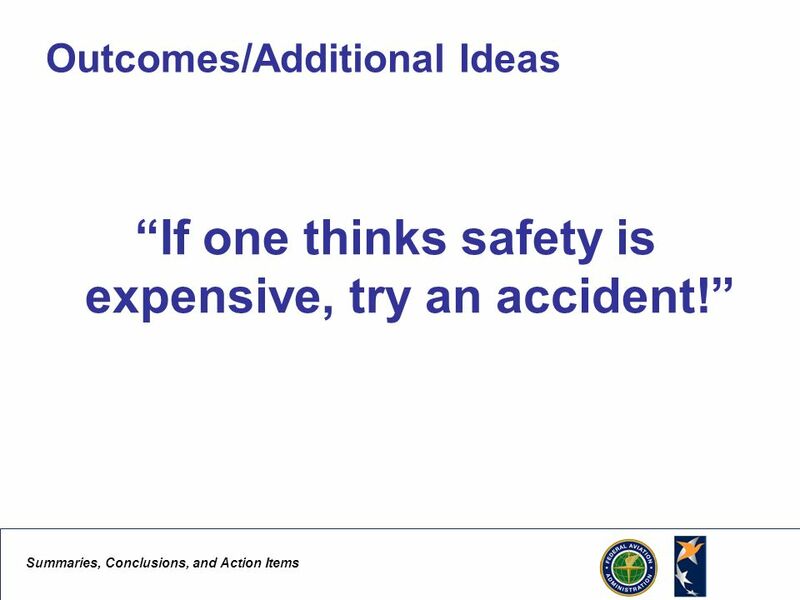 If one thinks safety is expensive, try an accident. 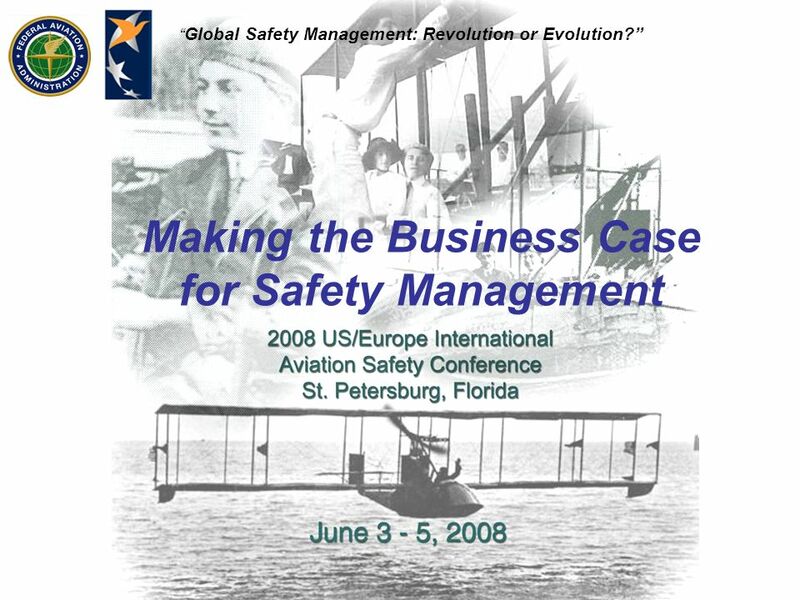 Download ppt "Making the Business Case for Safety Management"
Global Safety Management: Revolution or Evolution? State Safety Management Programmes: The Regulators Challenge. Global Safety Management: Revolution or Evolution? Transitioning to an SMS: Whats Missing? Global Safety Management: Revolution or Evolution? Update on Sport and Recreational Aviation. OCD Internal and Education and Training Purposes Only A New Approach for You to Create Broader, Long-term Customer Engagements CL12092. PROJECT TITLE Project Leader: Team: Executive Project Sponsor (As Required): Date: Month/Day/Year 110/17/2014 V1. Migrating to the Microsoft Application Platform Microsoft and partners make it easier. The Reality of the Struggle to Align the Business with I.T. Rosana F. Chaidez Large Company Technology Networking Conference June 17th – 18th, 2008. Materials Management BUS 3 – 141 Quality and Specification Leveraging Technical Excellence Week of Aug 31, 2010. TMW Maritime “At A Glance” Focus Why Us? Core Values Service Offerings Summary. Why Managers Must Understand IT Managers play a key role –Frame opportunities and threats so others can understand them –Evaluate and prioritize problems. Aust. AM Collaborative Group (AAMCOG) An introduction to ISO “What to do” guide 20th October 2014. Performance Monitoring All All Contracts require basic monitoring once awarded. The Goal of contract monitoring is to ensure that the contract is satisfactorily. INFORMATION SECURITY GOVERNANCE (ISG) Relates to the security of information systems Is an element of corporate governance.